Had one of these at the Minetta Tavern in Greenwich Village the other day, right around the corner from Todd Robinson’s watering hole, Shade. The Minetta is a fancy brasserie which serves an excellent Manhattan and Sazerac and delicious appetizers like salt pond oysters with truffled pork sausage. The oysters were fresh and sweet. Having read Mannahatta, about the original forested wilderness of Manhattan island, I know the Minetta was a brook that still exists underground. There was a huge salt pond in the area as well, and both the Natives and the Dutch settlers ate enough oysters that the shells form a sedimentary layer all over the tip of the island. Nowadays if you ate a New York bay oyster, an alien will pop out of your chest. The burger is twenty six bucks and ground from aged beef. They have a standard burger for seventeen bones. You do get fries with that. Sorry, frites. The fries are good, not as good as Bourdain’s at Les Halles. 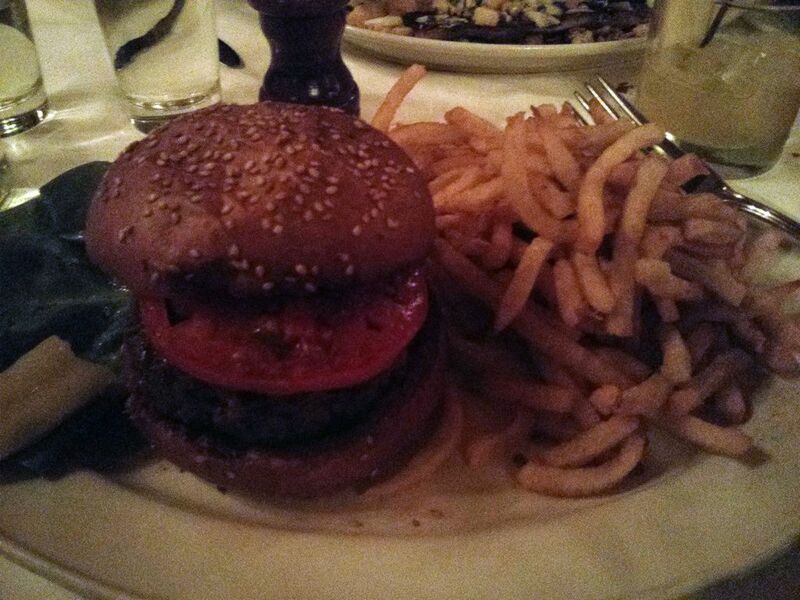 The burger is one of the few that tops the Les Halles burger, which is ground to order from sirloin trimmings. The Black Label one-ups it by using only dry-aged beef, giving the crust a distinct mineral tang that steakivores will appreciate. Inside it’s just a balanced, excellent burger- not too fatty but certainly not lean or dry. I will name it my new favorite, but let’s be honest- I’m not gonna lay down $26 for a burger that often. Krug’s is still my go-to. Here’s the list for you new folks. 7. The Frenchy, DBGB, NYC. 10. Jucy Lucy, Matt’s Bar, Minneapolis MN. These are opinions. Ray’s Hell Burger in VA closed; I haven’t been to Kuma’s in Chicago. In-N-Out and Elevation Burger, Shake Shack and the Joint at the Le Parker Meridien hotel are all up there as well. And I plan on a long road trip on the west coast eating nothing but cheeseburgers next year, so my opinions WILL change. If you have recommendations… please leave a comment. I will travel for a good burger, and I save places I’ve visited or want to visit in a Google Map: Tommy Salami’s Hidden Treasures.